This is a student's version of the electronic teacher's classroom version. Designed to support your student's outside the classroom. This is the first Phonemic Symbols Quiz App. It contains 3 levels of difficulty. There are five words within each level, taken from the Student's Workbook, for the student to solve. The student will hear the word in question and an indication of how many phonemes are contained in the word is displayed above the grid on the screen. Level 1 has an 8 box grid of symbols, Level 2, 12 and Level 3 a 16 box grid. The student's results will be displayed at the end of each level. Just attach your iPad or Apple computer to the classroom projector and you're ready to go! 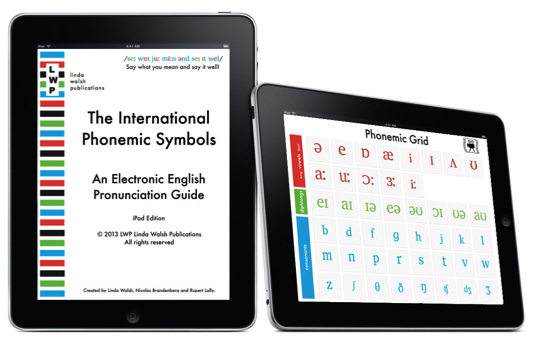 Our teacher's electronic IPA tool is one year old and we're celebrating by offering a 50% reduction on this iBook version of our unique colour-coded phonemic grid. I could never remember the phonemic symbols from my CELTA course. But now it's so easy and fun too! Teacher on one of our workshops in Solothurn, Switzerland. Thank you so much for the workshop! I never thought I'd say this, but I can't wait to start teaching the phonemic symbols using your method! Phonsy, an alien from Planet PSP10, lands on earth following an accident with his spaceship. There he meets two boys who would like to help him get back home. The only problem is that Phonsy can't speak English. He can only produce 'strange looking symbols' that look like lights. The boys don't know what the symbols mean. 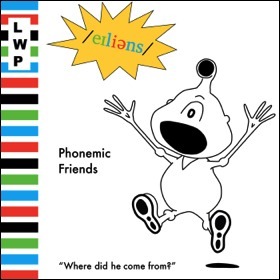 If they want to help Phonsy, they have to learn the phonemic symbols. This comic announces the arrival of our long-awaited lower primary school level printed materials intended to engage and motivate young students to learn the IPA. The main ingredient is 'fun'. A large dash of simplicity, clarity and consistency make up the other ingredients. A Supplementary Teacher's Resource Book supports the teacher using this comic with further symbol and sound activities, guidelines as to how to extend each unit and integrate it with vocabulary and grammar introduced in the student's normal course book. It is designed to be used in conjunction with the main Teacher's Resource Book published last year. This combination provides the teacher with comprehensive resources and support for teaching Grade 3 to adult student level. These 2 publications are sold in sets. For more details please visit the publications page on this website. If your students work in a Learning Management System such as Moodle, an extended version of the iBook classroom tool is also available in multiple licenses in packs of 25. Activities that students can work on independently or as entire classroom such as Double Flashcard, Hotspot and the Phonemic Maze. These activities are particularly suitable for large numbers of students in a class where each student would have access to a computer. 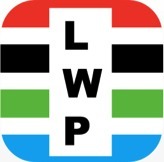 Was CHF5.- now CHF2.50 on the iBookstore for a limited period only. 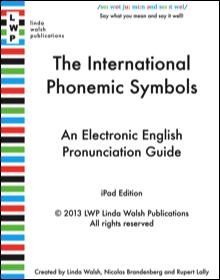 We are very pleased to announce that the iBook version of the new electronic classroom tool for teaching the International Phonemic Symbols (IPA) is available to download on the iBookstore! This can be run using the OSX Mavericks operating system on all Apple computers as well as the iPad. CLICK ON THE DOWNLOAD BUTTON ON THE LEFT TO ACCESS THE IBOOK STORE FOR A SAMPLE COPY! a glossary of mimes for each phonemic symbol.